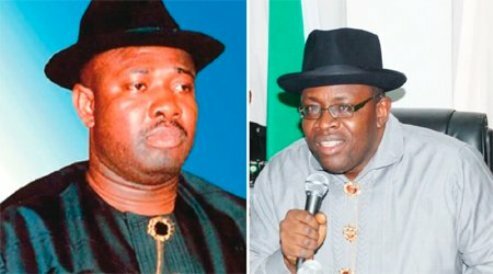 LAGOS FEBRUARY 12TH (NWSRANGERS)- Minister of State for Agriculture and Rural Development, Senator Heineken Lokpobiri and Bayelsa State Governor, Seriake Dickson had expressed divergent views on insecurity in Bayelsa. Dickson had on Friday accused Lokpobiri and leaders of All Progressives Congress (APC) of being the masterminds of election violence in the state. Leader of APC in Bayelsa Ex-Governor Timipre Sylva, Lokpobiri had led members of APC on a protest to Police headquarters in Bayelsa over killing of APC members during rallies. A statement signed by Mr George Orgi, Special Adviser to Lokpobiri on Media noted that Dickson in his characteristic manner has resorted to blame-game against the main opposition political party. Lokobiri stated that accusing APC in the state of, “plotting to use the security agencies to rig, manipulate and unleash violence on voters in the state.” Was false and malicious. “ It is also an indisputable fact the the governor has gone ahead to appoint militants as Chairmen and Vice Chairmen of Local Government Councils and to use them to continue to perpetrate violence across the state. “These miscreants upon interrogation revealed the source and funders of the arms found in their possession, ,” Lokpobiri stated. “The APC is moving in full force to reclaim the state, starting with a landslide victory at the Presidential and National Assembly polls, which will take place on Saturday, February 16. “Lokpobiri believes that Dickson is only trying to run away from his negative shadows haunting him, by stoking non existent allegations to cover up his failure in office. “The governor should face the obvious challenge of explaining his stewardship in office to the people of Bayelsa. He must explain what he did with the over N1.3trillion he has so far received from the Federal Government,” Lokpobiri stated. Lokpobiri said that the governor is conscious that his tenure in office would soon come to an end and it would be time to account for his stewardship, adding that it was the reason Dickson. is panicky.